Pizza is a yeasted flatbread popularly topped with tomato sauce and cheese and baked in an oven. It is commonly topped with a selection of meats, vegetables and condiments. The term was first recorded in the 10th century, in a Latin manuscript from Gaeta in Central Italy.The modern pizza was invented in Naples, Italy, and the dish and its variants have since become popular and common in many areas of the world. Your choice of toppings are: Ham, Pepperoni, Sausage, Spinach, Onion, Olives, Green Peppers, Bacon, Banana Peppers, Mushrooms, Meatballs, Pineapple, Salami, Double Cheese, Feta Cheese, Fresh Tomatoes, add grilled chicken for an extra $2.75. 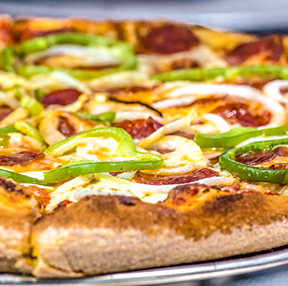 New York Deli & Pizza Restaurant is the #1 stop in Williamsburg for authentic New York-style pizza, sandwiches, subs and much more. Family owned and operated, New York Deli & Pizza has won "Best Deli in Williamsburg" each year since its opening in 2005. Enjoy our casual dining room, or call to place a carry-out order for lunch or dinner. BEST REUBEN I HAVE EVER TASTED!